MySQL Workbench includes options to improve user accessibility that you can select from the Workbench Preferences dialog. To open the dialog, click Edit and then Preferences from the menu. Modeling fonts are adjustable from the Appearance section of the Modeling list. 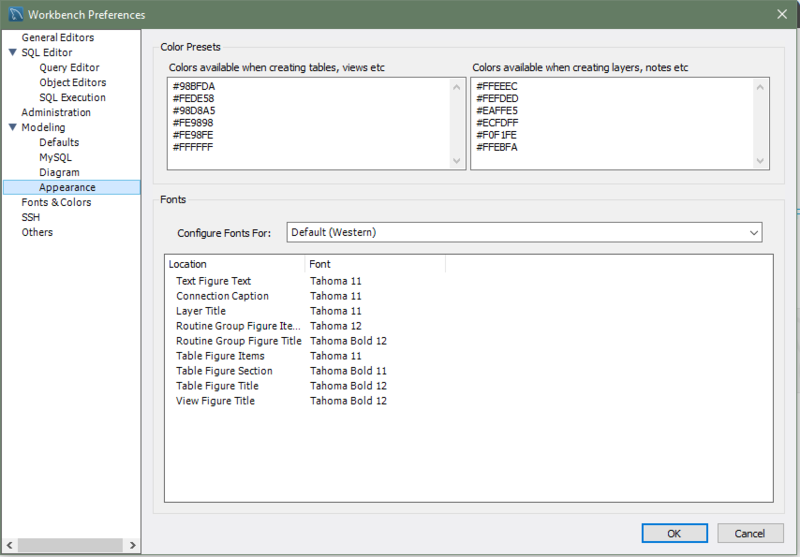 The following figure shows the color presets and fonts. Choose the character set from the Configure Fonts For list (or leave the default setting) and then adjust the model fonts to fit your requirements. The font types and sizes for other screen elements are set from the Fonts & Colors preferences. 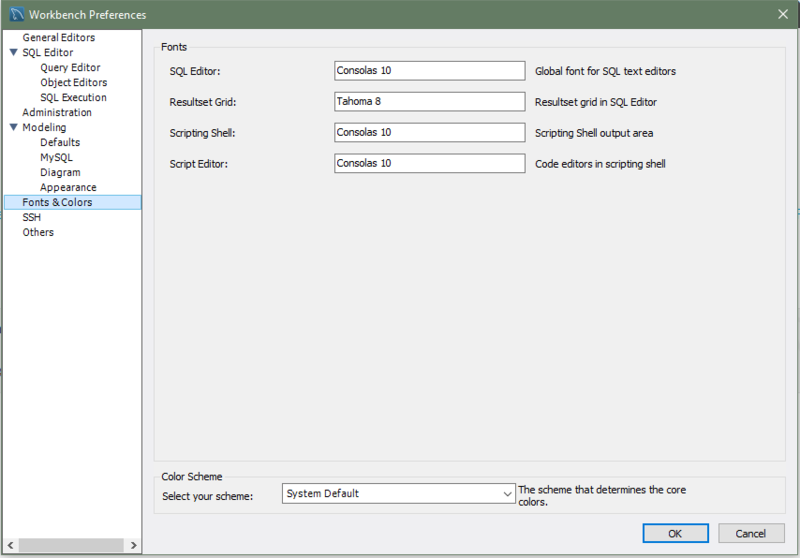 The next figure shows the default fonts for the SQL Editor, Resultset Grid, Scripting Shell, and Script Editor. Font changes require a refresh or restart before they take effect. The following figure shows an example of the SQL Editor after changing the Editor font size from 10 to 30. Color presets in the Appearance preferences enable you to define the colors used in EER diagrams for the tables, views, layers, and notes. You can edit or add additional color choices by entering their ASCII values. On Windows, the Fonts & Colors preference tab also includes a "Color Scheme" configuration section. From here, you can enable the High Contrast color theme (see the figure that follows). 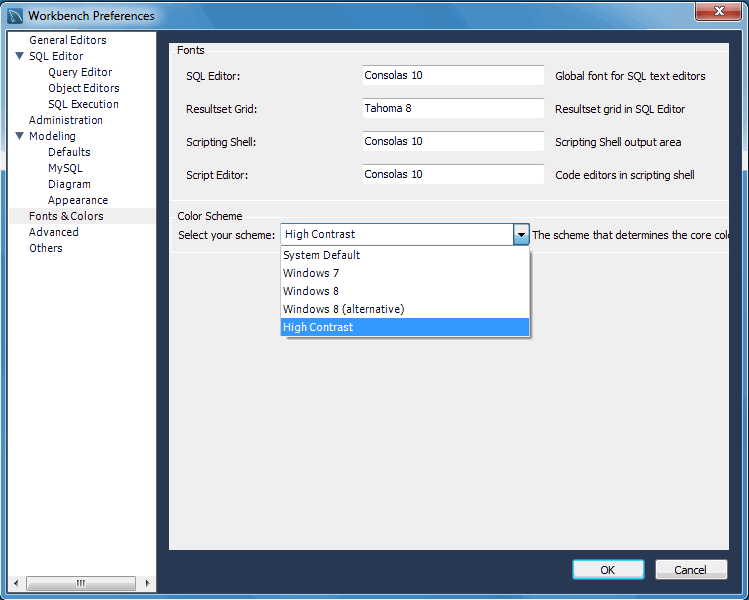 This theme preference affects the MySQL Workbench GUI. 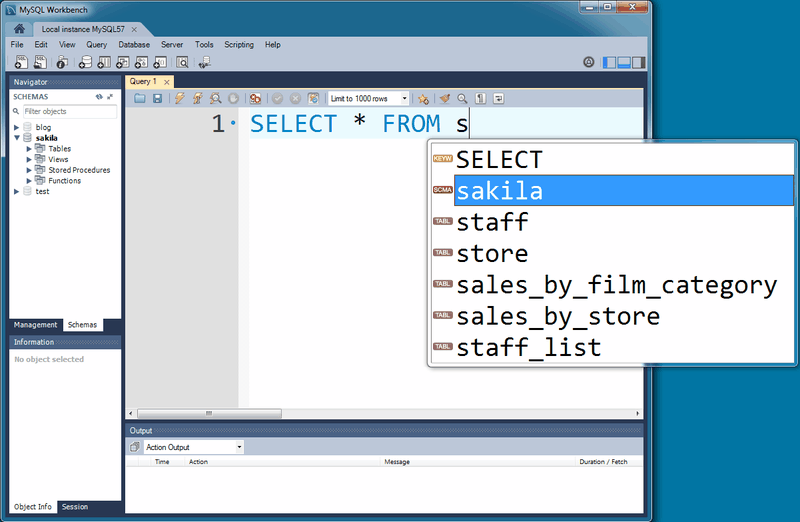 On Windows, MySQL Workbench supports MSAA, which enables the use of screen reader applications with MySQL Workbench.